Back in August I headed out to Edale to photograph the sunset from Kinder Scout, the highest of the mountains in the Peak District. The plan was then to meet with some fellow photographers in Edale village. Shoot the lovely little church bathed in late afternoon sun then hike up to the peak of Kinder and wait. After driving from Hayfield toward Castleton, the road bathed in sunlight I was optimistic to say the least. After turning left to go over the great ridge I descended down into the Edale valley and a somewhat overcast sky... ok I thought, nevermind, weather changes quickly here, so I parked up, met up with Mat Robinson and Michael Cummins (two excellent and respected Peak District togs) and we headed out. As we ascended the hills, the weather drew in. The clouds surrounded us, the wind picked up and it started to rain - for the record I have never been that wet (just watch the video captured by Mat below). After walking around for an hour or two we settled near the peak. Cameras were whipped out when the rain eased off slightly and we started to shoot in the hope we would get some light or a break in the horrendous conditions. In these circumstances it's very hard to keep your lens dry, or your camera still because the tripod is being buffeted by gale force winds, and to capture anything close to the correct exposure. But I persevered, took around 20 shots and as the light drew in (by this point it was evident the sun was not going to make an appearance) descended back down to Edale and the pub to dry off. Once home and once I'd dried my Canon 5Dmk2 out, I went though the images. Ok, not bad I thought. Moody rather than spectacular sunset, but ok, let's take a look. The first location we stopped at saw us surrounded by clouds. The brighter conditions meant I was able to take my camera out, but you can see by all the rainspots on my lens it wasn't going to work. Shame though, it would have made a nice location for sunset too. Finally the weather eased a little giving better conditions (marginally). So I was able to start shooting down towards the Edale valley with the rocks in the foreground. It's amazing how much difference a slight change in light can have to the colours. The constantly changing light meant I had to take a number of differently exposed photographs. I stitched a couple of images together for this final effort, desaturating it a little to increase the moodiness of the shot. I suppose this reflects the evening and how I was feeling at the time! After the August bank holiday weekend trip up Kinder, I headed up to Greenfield and Yeoman Reservoir towards the end of September hoping to capture sunset from the Trinnacle, one of the many famous rock formations the Peak District is known for. Great weather conditions but it soon transpired that it was going to be a race to get to it before the sun dipped below the hills opposite. Sunset times and guides are great but I think this is a summer shoot rather than Autumn. 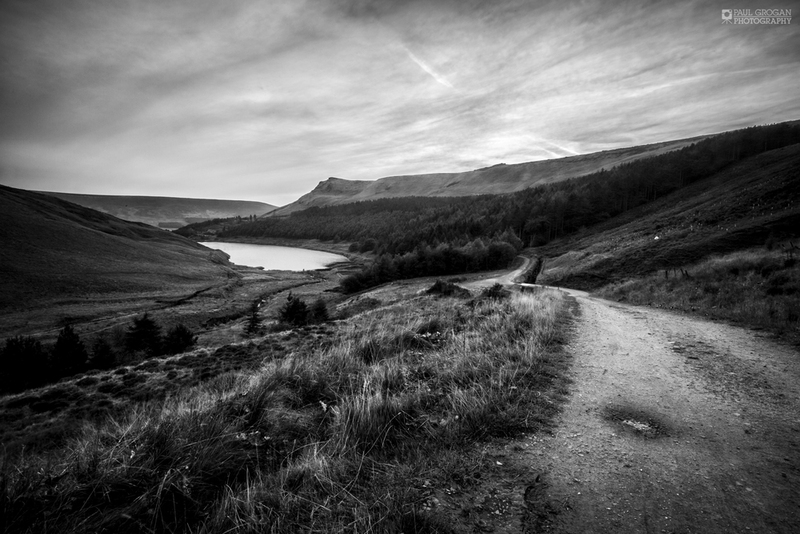 So rather than waste the opportunity I looked around at some of the potential landscapes I'd seen on the walk up from Dovestones car park and headed back down. The first was the Greenfield Brook which is a gorgeous little waterfall near the Trinnacle but is often dry in summer. Following this back down along the path as darkness drew in the sky went bright red. Camera was out and on the tripod super quick before the light passed. You can just make out the Trinnacle in the top right hand corner of the frame. Around 20-25 minutes further up would have meant losing all the light. There was still some nice light to capture though. I chose to convert this one to black and white to make the most of the moody landscape. Even though the sun had long gone behind the hills on the right of the shot, the photography gods smiled upon me and blessed me with some amazing light. When I first took up landscape photography again (after a rather large gap) my good friend Dorcas of Fotodayz said to me on a refresher course in Malham - "come prepared for the Great British weather and even if it's raining we will still get some shots." I've always remembered that and to date, have always succeeded in getting a photograph I was happy with. So despite the lack of sunsets on both shoots, I still managed to get some nice photographs, one of which was bought by a customer in Australia!